Go fishing for the local blue and white marlin on a boat charter from Punta Cana. 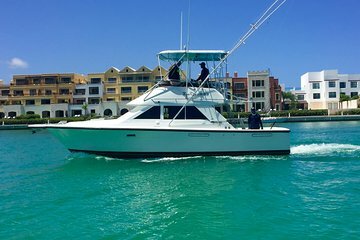 Head out into the deep waters around the Dominican Republic, where a captain will show you secret local spots, giving you the best chance of catching a marlin. With guidance and all equipment provided, you'll also be able to catch and release tuna, wahoo, mahi mahi, and billfish. Snacks and drinks are provided throughout the day to keep you energized. What a great 4 hours even in 6 to 8 foot seas. This was by far one of the best values going. Total in 4 hours we caught 13 Mahi. These guys do it all setup all lines all you do is reel them in. I do wish we could have gotten pics with all the fish but they only brought out 3 for pictures.